Phoenix West PHX 1605, 3 Bedrooms, 4 Bathrooms, Sleeps 10. Newly renovated - just like checking into a brand new unit!! Beautifully furnished with gorgeous views of the Gulf! No Check in Required - go directly to your unit - no long lines to wait in - start your vacation as soon as you get to the beach!! Guest Bedroom w/2 queens 26"
Very nice condo and well worth the stay! Very clean, easy access to beach, and would definitely stay again! Very spacious and beautiful condo!! We enjoyed our stay. 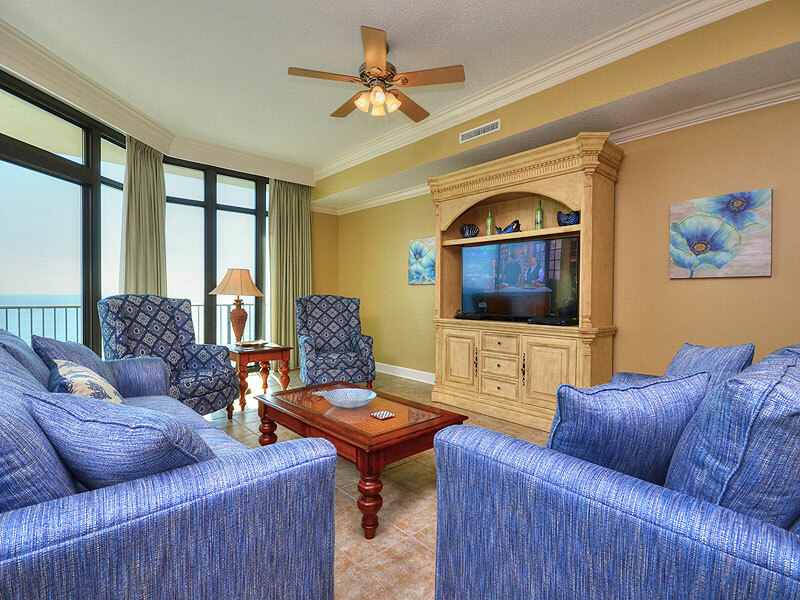 It is a very spacious condo, with a large balcony and gorgeous view of the gulf! We had a lovely stay and enjoyed this clean and spacious condo. There were 7 of us we had plenty of room. Having 4 full bathrooms was so nice also. No lines, no waiting! The living room TV was a Samsung smart TV which is what we have at home. It was so easy to operate and had not only satellite, but also Netflix and YouTube. The kids had plenty to watch during down time. Mostly we were at the beach, pools or balcony though. The lazy river, slide and zero entry pool were awesome for us. We only left the condo once to go out. With the kitchen for cooking and plenty of entertainment onsite for the kids, we did not have to find other things to do. We vacationed with the family and everyone really enjoyed themselves. This unit was so clean. It was also stocked with everything we needed. Loved the luxury hotel bedding (no yucky bedspreads). The building had everything you could ask for. Indoor and outdoor Pools, workout room, lazy river, we easily kept the kids (and adults) entertained the entire trip. We will be back and we will stay in the same unit again. Highly recommend it! The room was better than expected and very spacious! The only negatives from our visit involved the crowded facility and lack of parking available which should be expected from any large condominium complex. The elevators were fairly slow and crowded, on average waited around 5 minutes and several passes to be able to get onto an elevator. The condo had great views of the gulf and easily accommodated my group of 9. Would recommend to others. Right on the beach with amazing views. Very clean and spacious for a large group and short driving (or walking) distance from lots of shops and restaurants. Definitely would stay here again! Thanks for the 5* rating. Enjoyed our stay! The condo is nicely decorated and fully equipped. Would definitely stay here again! The booking process was very easy and our condo thoroughly exceeded our expectations! If you have stayed at Phoenix West II, it is basically the same layout. My family enjoyed the lazy river and the pool. The walk to the beach seemed shorter than other properties that we have stayed at in the past. It was just a few short steps from the pool to the beach front. One of the minor inconveniences was the lack of an ice maker that was located in the bar area. We called when we arrived and the maintenance person didn't arrive until the day we checked out. The beds are very comfortable, but the kitchen was not as well stocked as other units I have stayed at in the past. Overall nice place and I would stay there again. We are glad you enjoyed your stay. We look forward to your return. The ice maker has been repaired. The kitchen is stocked with the standard items that are common in other Phoenix West condos.